Imagine drifting through the sleepy French countryside as your personal chef prepares a gourmet feast for you and a few friends. Isn’t that a vision to savour? Mike Crowson arguably has the best views of any chef afloat – and things look (and smell) pretty good from where passengers are sitting too. 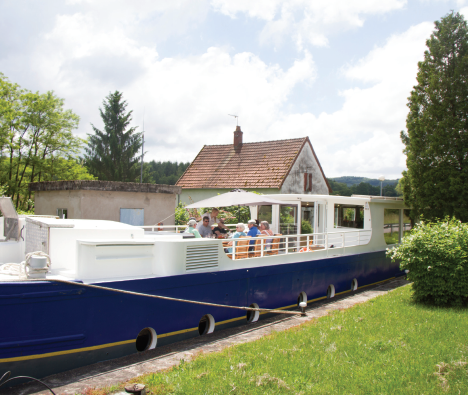 The chef is at the culinary helm of Finesse, the latest addition to European Waterways’ fleet, which sails sedately through the bucolic countryside of southern Burgundy along the Saone River and Canal du Centre between St-Jean-de-Losne and St-Julien-sur-Dheune. Found languishing in a sad state in a Belgian shipyard, the 128ft vessel began life in the 1950s as a freight barge – but after a bow-to-stern transformation it is now a floating boutique hotel, carrying just eight guests and a crew of five. A unique feature is the demonstration galley, which is an integral part of the light and airy saloon and dining room. A unique feature is the demonstration galley, which is an integral part of the light and airy saloon and dining room. When they’re not gazing at the passing scenery through the panoramic windows, guests can look forward to their meals in every sense of the word. After breakfast, Mike sets to work creating the day’s lunch and dinner menus, which are a gourmet highlight of the fully-inclusive, and personalised, onboard experience. “I love cooking and I love eating, so I am very lucky to have a hobby that is my job,” says Mike, who has worked at leading small restaurants on dry land, including the acclaimed Well House in Cornwall. “I have never wanted to cook for hundreds of people, so cooking for this number is perfect. When guests arrive onboard, Mike talks to everyone to assess likes, dislikes and dietary requirements, and will adapt meals accordingly on the six-night cruises that are either booked by individual passengers or chartered by groups of family and friends. After each cruise passengers receive a souvenir “food diary” charting the lunches and dinners served during the week, along with the different Burgundian wines picked to accompany each course – although they can pick their own personal favourites from the free-flowing wine list. Dinner delights might include an appetizer of wild girolles mushrooms, followed by guinea fowl, a trio of French regional cheeses and dessert of lemon tart with basil and lime sorbet. As lunch in France is an institution, guests can expect three-course affairs of pea soup with feta, quiche Lorraine and apricot clafoutis with apricot ice cream, or maybe cheese soufflé, artichoke salad and vanilla panna cotta with summer berries. Passengers dine at a large table in the saloon, or al fresco on the deck in fine weather, with meals set against an ever-changing backdrop of vineyards, small villages and pastures filled with white Charolais cattle that are a hallmark of the Burgundy landscape. If lunch coincides with the time the lock keeper clocks off, there might even be the novelty of eating inside a lock until he’s back on duty and ready to open the gates. Finesse moves at a walking pace so passengers can nip off at any time to burn a few calories along the towpath, or on one of the onboard bikes. The other option – and the one I usually went for – is a restorative nap in the beautiful 265sq ft cabins (some of the largest on European waterways). Mike has an extensive repertoire of recipes, all neatly written out in notebooks. 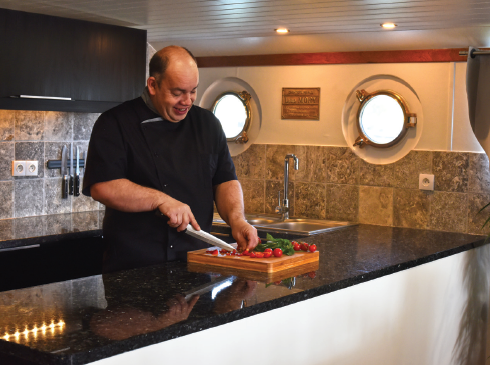 Making the most of the extensive food and wine pantry on Finesse’s floating doorstep, his dishes showcase regional and seasonal ingredients, and while passengers are off on excursions Mike will be stocking up in local shops and markets. With forthcoming temptations evolving in the open galley, passengers are in foodie heaven as they sip an aperitif and watch multi-tasking Mike cut, chop, cook and chat. He also runs impromptu cooking demonstrations, with passengers deciding what they want to see. Our party was curious to discover the secrets of a foolproof soufflé, and Mike was delighted to oblige. Half an hour later, a tray of soufflés emerges from the oven – and they lose none of their height when later reheated for dinner. Along the way Mike shares all manner of tips, from using spent vanilla pods to flavour sugar, to truffle-flavoured products that are not the real deal. My own favourite dish? 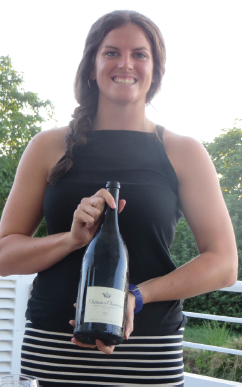 The food was so fabulous it’s impossible to choose, but the garlicky escargots with pre-dinner cocktails couldn’t have been more fitting for a leisurely week exploring the waterways of Burgundy at a snail’s pace with a floating chef. The 6-night Classic Southern Burgundy itinerary on Finesse, available from April to October 2017, costs from £4,290pp, based on two people sharing a cabin, including all onboard meals, wines with lunch and dinner, unlimited drinks, daily excursions and local transfers. See gobarging.com, 01753 598 555.